Thanks everyone for the enthusiastic, stimulating and inspiring reactions to our first bread video. And also to all the people who tasted our bread this year and asked for more! and also gave very useful tips for improvement and additions. More and more we are convinced of the positive properties of good bread. We see that bread is the food that binds people all over the world. And there’s so much more to try out and perfect. We look forward to lots and lots of baking in the new year and sharing bread and tips and recipes with other bakers. Maybe it sounds a bit emotional and sentimental, but the year is drawing to a close and you look at the balance and realize there is a lot to be thankful for. The thing Ed and me both wish for is more time. We found out that time is a very good friend to our bread and it would also be for a lot of people. So our wish for everybody is to have more time to enjoy good food and good company in the new year. On with the baking! This weekend we went a bit overboard and baked 14 breads, 5 cakes, 3 pizza’s and still managed to try out a few new recipes for mincemeat and puddings AND watch several Christmas cooking shows and old Christmas movies like the original ‘Miracle on 34th Street’ with Natalie Wood from 1947, and look out of the window watching the snowflakes fall! We didn’t get to watch ‘Groundhog day’, which is my favorite sort of seasonal movie, but hopefully that’s on for tonight! Below the recipe for the wonderful fruitcake with cardamom you see in the picture above (here I made mini versions in my new baby bundt pan). This cake is such a good combination with a cup of cappuccino! There is 25% wholeweat in this loaf, so it’s fruity, nutty and healthy! This is easy. Preheat the oven at 175° C. Cut the dried apricots in little pieces, add the raisins and soak this in the liqueur for at least 30 minutes. Mix the butter and sugar well and add the eggs one by one until light and fluffy. 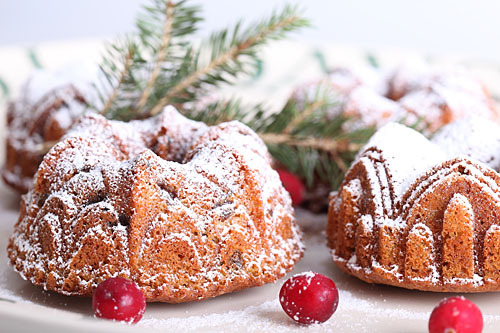 Carefully Mix in the other ingredients and but the mixture in a greased cake or bundt form. With an ingredient like cardamom it’s important to get the amount just right, too much will be overpowering and too little will be a shame. Try to taste and test a little as you put it in. I also put in the liqueur that’s left over after the fruit has soaked. If you find the mixture to dry, you can also add a little milk. This cake takes a while to bake, so have some patience. If you make the big cake with all of the ingredients it takes at least an hour to 70 minutes depending on your oven. For a small cake with half the ingredients (perfect for sharing with a few friends) it takes about 45 minutes. Just keep an eye on the process. Meanwhile the house is filled with warm, welcoming smells that seem to be made for cold winters, I love that about this cake! And while snow is falling all around, you and your loved ones will be cozy and warm inside enjoying this cake with coffee or tea by the fire. Last Minute tip: We tried out the Hairy Bikers ‘Christmas Panna Cotta’ with rum soaked raisins, ginger, allspice, cinnamon and nutmeg. What a yummy fragrant pudding! We loved it! Just glad you are doing OK because we do care for you and want you to know you are always welcome! We really want to taste all of the wonderful baking you mentioned and want to visit the Brothers Niemeijer bakery definitely again in the new year. Happy Holidays and see you in what will hopefully be a very tasteful 2010! Oh, and your baked goods are to die for!! Guys, happy, happy holidays to you!! I know I should have been more responsive lately, but it so happened that I haven’t. The blame is all on me. In my own defence, though, I spent all my time learning how to make chocolate tartlets, st-pierres (french crumbly mini-cakes to be eaten in two, three at max, greedy bites), tarte Tatins, among much else! Hope to meet up in 2010 for a pizza and more!!! !